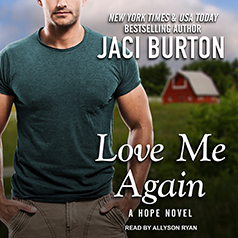 In the latest novel from the New York Times bestselling author of Don't Let Go, it's never too late for a second chance at first love. Contains mature themes. When Loretta Simmons returns to Hope, Oklahoma, after a disastrous marriage, she's determined to remain independent for the sake of her daughter. The only thing standing in her way is Deacon Fox—the man she loved and walked away from years ago. Since Loretta owns the bookstore right next to his current renovation project, Deacon can’t escape the woman who broke his heart. Throw in her adorable little girl and one ridiculously oversized dog, and they're almost a family. Only he can't be that guy—what they had was once in a lifetime.